This is one of my favorite comfort food because of the fact that I like noodles of every kind. This dish is made up of combining patola (luffa), pork, shrimp and misua or miswa, a very thin thread-like Chinese salted noodles made from wheat flour, eggs and of course salt and water. I think this noodles is one of the things we inherited from the early Chinese immigrants. This dish is very simple, healthy and easy to digest. It is also one of the cheapest dished you can make. 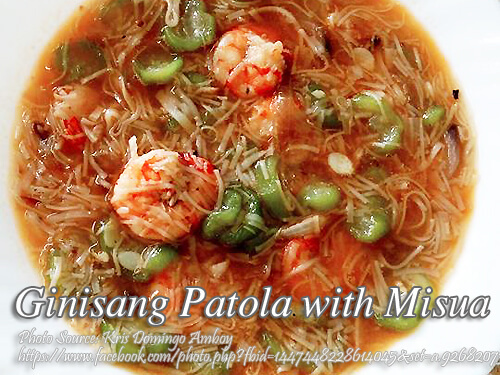 So if you want to stretch your budget and make a delicious viand, then I think you should give this dish a try. To cook ginisang patola with misua; Peel the patola, slice into thick roll pieces. Set aside. Make shrimp juice by pouring 1/2 cup hot water on the shrimp shells and heads. Using a sieve, separate the shells and heads of the shrimp and collect the liquid. The liquid is the shrimp juice. Saute garlic until brown, add onion and when it becomes soft, add the pork. Saute again for 2 minutes, add 1/2 cup water and cover. Cook until the pork is tender. Add shrimp and patis. Stir. Then pour in shrimp juice. Stir gently until it boils. Add the patola and MSG. When patola is almost cooked, add the misua. Cook again for about 2 minutes and serve hot. Peel the patola, slice into thick roll pieces. Set aside. Make shrimp juice by pouring ½ cup hot water on the shrimp shells and heads. Using a sieve, separate the shells and heads of the shrimp and collect the liquid. The liquid is the shrimp juice. Saute garlic until brown, add onion and when it becomes soft, add the pork. Saute again for 2 minutes, add ½ cup water and cover. Cook until the pork is tender. Add shrimp and patis. Stir. Then pour in shrimp juice. Stir gently until it boils. Add the patola and MSG. When patola is almost cooked, add the misua. Cook again for about 2 minutes and serve hot. This was delicious! My wife, who is Chinese, loved it also. I think this recipe will become one of my favorites. Thank you, Manny, for posting it. Hi Herman, thanks for sharing your experience and I do hope you will visit this often!